What kinds of histological stains are there? Most cells are colourless and transparent, and therefore histological sections have to be stained in some way to make the cells visible. The techniques used can either be non-specific, staining most of the cells in much the same way, or specific, selectively staining particular chemical groupings or molecules within cells or tissues. Staining usually works by using a dye, that stains some of the cells components a bright colour, together with a counterstain that stains the rest of the cell a different colour. Acidic dyes react with cationic or basic components in cells. Proteins and other components in the cytoplasm are basic, and will bind to acidic dyes. Another way of saying this is that cytoplasmic proteins are acidophilic (acid liking - i.e. bind to acidic dyes). Basic dyes react with anionic or acidic components in cells. Nucleic acids are acidic, and therefore bind to basic dyes. Another way of saying this is that nucleic acids are basophilic (basic liking). The most commonly used staining system is called H&E (Haemotoxylin and Eosin). H&E contains the two dyes haemotoxylin and eosin. Eosin is an acidic dye: it is negatively charged (general formula for acidic dyes is: Na+dye-). It stains basic (or acidophilic) structures red or pink. This is also sometimes termed 'eosinophilic'. Thus the cytoplasm is stained pink in the picture below, by H&E staining. Thus the nucleus is stained purple in the picture below, by H&E staining. This means that the nucleus, and parts of the cytoplasm that contain RNA stain up in one colour (purple), and the rest of the cytoplasm stains up a different colour (pink). This is a picture of a group of cells lining a duct. 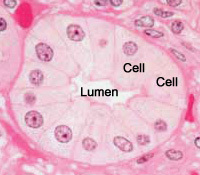 The lumen of the duct, and two cells are labelled. Can you spot the nuclei? What structures are stained purple (basophilic)? DNA (heterochromatin and the nucleolus) in the nucleus, and RNA in ribosomes and in the rough endoplasmic reticulum are both acidic, and so haemotoxylin binds to them and stains them purple. Some extracellular materials (i.e. carbohydrates in cartilage) are also basophilic. What structures are stained pink (eosinophilic or acidophilic)? Most proteins in the cytoplasm are basic, and so eosin binds to these proteins and stains them pink. This includes cytoplasmic filaments in muscle cells, intracellular membranes, and extracellular fibres. There are many other kinds of stains each of which stain tissues in characteristic ways. Questions for you to think about. How big is the cell diameter, for the cell in this picture? Why are the nuclei in the image shown above different sizes? Are they really different sizes, or is there an alternative explanation? (Hint, think about what happened when the sections were cut, and about how big the cells are).